Honor Italy's illustrious soccer heritage with this limited edition ball. It honors the past with its hand-crafted full-grain leather construction. The ball also pays tribute to Italy's current soccer glory and future with the gold foil signatures of Italy's 2008/2009 national team players. 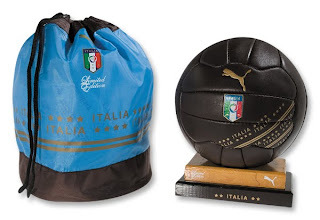 It comes with a wooden display stand and commemorative bag making it a great gift for fans of the Azzurri. We have less than 200 in stock and at this special price, it's a great buy!